One of only four windmills open to the public in Greater London, Shirley Windmill is a Tower Mill, built in 1854 by Richard Alwen to replace an earlier (1808) timber post-mill on this site, lost by fire. It ceased working in about 1890, but most of the original machinery, including its two pairs of millstones, is still in place, and has recently been restored, so there is a lot to see. One of the last windmills to be built in this country, this fascinating piece of industrial archaeology is opened to visitors regularly in the summer months. It is a great place to visit for young and old alike as it is virtually complete, and thus the story of milling flour in Victorian times can be easily understood. You are sure to receive a warm welcome when you visit this interesting part of Croydon’s history, so why not come along and see for yourself? The windmill is usually open for guided tours on the first Sunday of the month, from June to October, and also on National Mills Day (in May) and London Open House Day (in September), with limited weekday opening for group visits by arrangement. The adjacent Visitor Centre contains informative displays and offers refreshments and souvenirs. 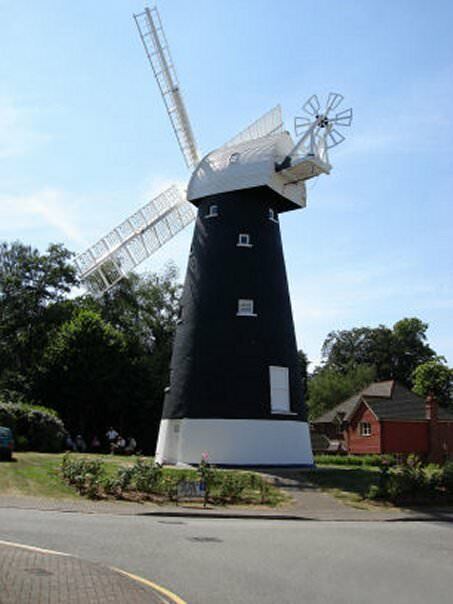 Though owned, maintained and repaired by Croydon Council, the windmill is staffed and managed on Open Days entirely by The Friends of Shirley Windmill, a group of volunteers interested in the mill and its history who are keen to enable as many people as possible to visit and enjoy this part of Croydon’s heritage. Have a look at the rest of this website for information on various aspects of Shirley Windmill, post a comment or a query on our contacting us page, or for further details, please contact the Hon. Secretary, on 020 8406 4676.